On the first weekend of April I took to the road and headed up to Newcastle – one of my favourite places – for its inaugural writers festival. What a great weekend! 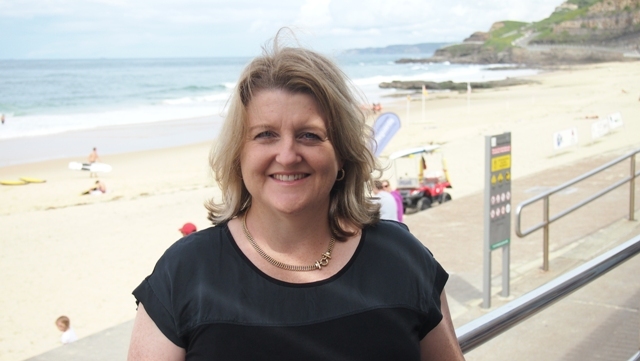 Massive kudos, congratulations and thanks to Newcastle Writers Festival manager Rosemarie Milsom and her team of helpers for hosting a truly wonderful event. I’ll be back next year for sure. 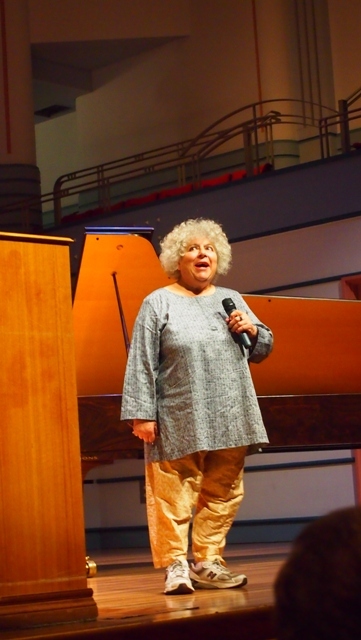 Opening night was a blast with acclaimed actor and Dickens devotee Miriam Margolyes expounding on Why Words Matter. Her speech was rambling, funny, poignant and everything in between, and it’s a great sign of her talent that she managed to convince the entire University of Newcastle Conservatorium to sing along with her to Daisy, Daisy. We all decamped across the road to the library for drinks, nibbles and mingling afterwards with huge smiles on our faces. If you’d like to hear Miriam’s opening night address, The Herald has kindly made the audio available on their website. Except for a few dark clouds out to sea, Saturday was a typical gorgeous Newcastle day. We spent the morning taking in some of the (very familiar) sights before wandering up Hunter Street to Newcastle beach for a gaze around. 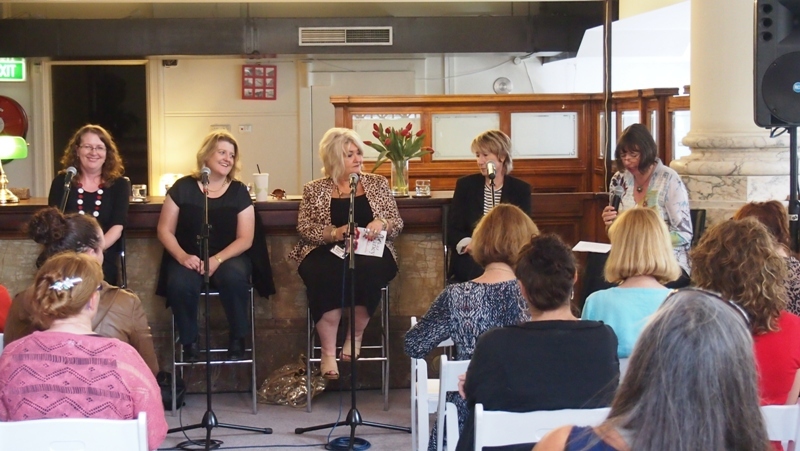 Then it was time to join my fellow Heart of the Matter panellists Kaz Delaney, Michelle Douglas, Deborah Challinor and moderator Annie West for a spot of lunch at Raw Cafe, a rather inspirational place for a bunch of romance writers given the wait staff! 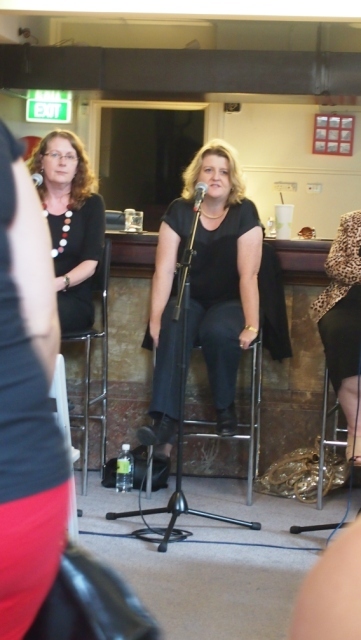 Inspirational also was the venue for our Heart of the Matter: Writing Romance panel. The session was held at the Newcastle City Business Centre, in an historic sandstone former bank, and the interior was sumptuous, with polished timber panelling, marble mountings and a beautiful chandelier. Although Kaz Delaney, bless her, managed to out-glitter even that with all her bling. thing about being a romance author. I said structural edits, which had everyone nodding. Everyone except Deborah Challinor, who, for some odd reason, actually likes them. A sentiment also repeated on Sunday by Courtney Collins, author of the Stella Prize nominated and highly acclaimed novel The Burial, during our A Fine Debut session. This, dear readers, is not normal! I know structural edits are very, very good for us, vital in fact but, believe me, those babies hurt. Wondering how the hell to answer THAT curly question! literary prizes. And there I was yabbering about being thrown out to do radio interviews with no experience at all, which turned out to be great fun in the end, but nothing like the hoopla Courtney’s had and is still enjoying. Good on her, too. She was lovely and interesting and I’m very much looking forward to reading her book. So all in all a joyous time, and another heartfelt round of applause must go to the organisers and to Newcastle itself for getting behind this excellent event. There were lines snaking into the street for some sessions and I just loved how there was a session to cater for every taste. No literary snobbery in Newie! I must also say a huge thanks to MacLean’s Booksellers who did a fine job of stocking and displaying everyone’s books. Special thanks to Kylie who had me signing store copies and is going to help me arrange some more talks in Newcastle later in the year. Stay tuned for details on that. 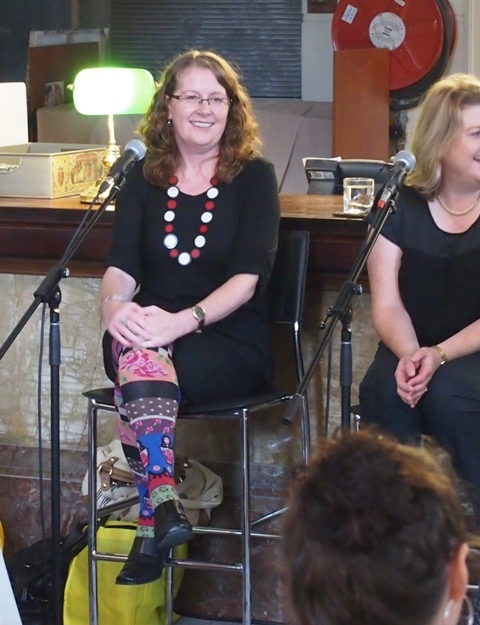 If you’d like to see more photos of the weekend check out the Newcastle Writers Festival Facebook page. And while you’re at it, mark your calendars for next year’s festival. I’ll be there with bells on! This entry was posted in This Writing Life and tagged A Fine Debut, Annie West, Australian romance authors, Australian Writers, Cathryn Hein, Courtney Collins, Deborah Challinor, Heart of the Matter, Heart of the Matter: Writing Romance, Kaz Delaney, MacLean's Booksellers, Michelle Douglas, Miriam Margolyes, Newcastle, Newcastle Herald, Newcastle Writers Festival, Romance Writing, Rosemarie Milsom, rural romance, The Burial, The Herald, This writing life, Why Words Matter, Writing on April 23, 2013 by cathrynhein.